In a previous tutorial, we learned how Photoshop's Paste Into command lets us easily place one photo into a selected area of another photo. 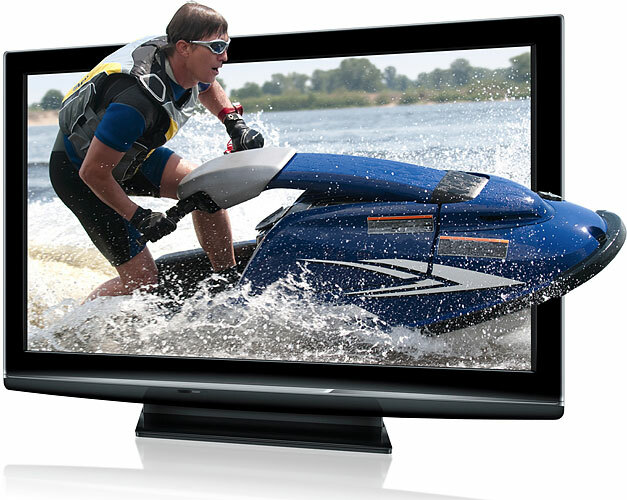 In that tutorial, we recreated the same effect seen every week in electronics store flyers where the latest movie or video game is displayed on all the latest big screen HDTV's. In this tutorial, we'll add more action and excitement to the effect by making a person or object appear to be leaping right out of the screen! To create this effect, you'll need a photo of a tv, computer monitor, cell phone or something similar (a quick Google search will give you lots of choices), and you'll need the photo that contains the person or object that will be jumping out of the screen. I'll be using Photoshop CS5 throughout this tutorial, but any recent version of Photoshop will work. 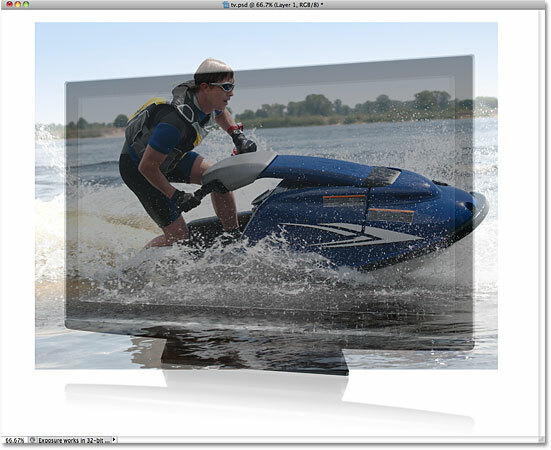 Who needs an expensive 3D tv when you've got Photoshop! 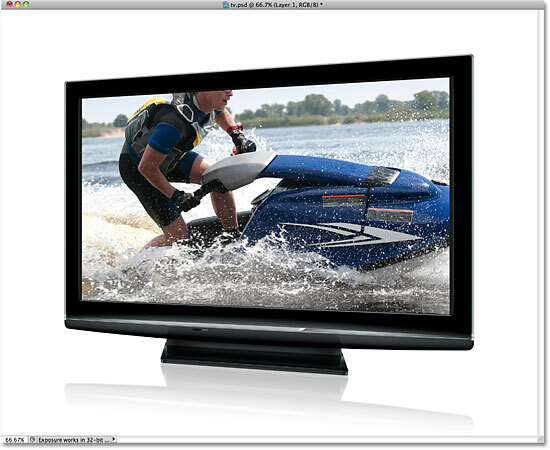 Any device with a screen on it (tv, monitor, cell phone, etc) will work. The Polygonal Lasso Tool is great at selecting straight-sided shapes. Click in each corner of the screen in a clockwise direction, then back in the original corner to close the selection. Action photos work best with this effect. 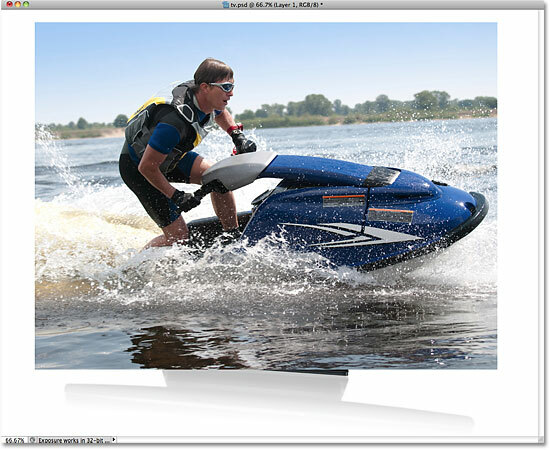 Press Ctrl+A (Win) / Command+A (Mac) on your keyboard to quickly select the entire image. A selection outline will appear around it. Then press Ctrl+C (Win) / Command+C (Mac) to copy the image to the clipboard. The Paste Special menu item is new in Photoshop CS5. The image now appears on tv. The image is added to a new layer, complete with a layer mask. A large red "X" through the preview thumbnail means the layer mask is currently disabled. 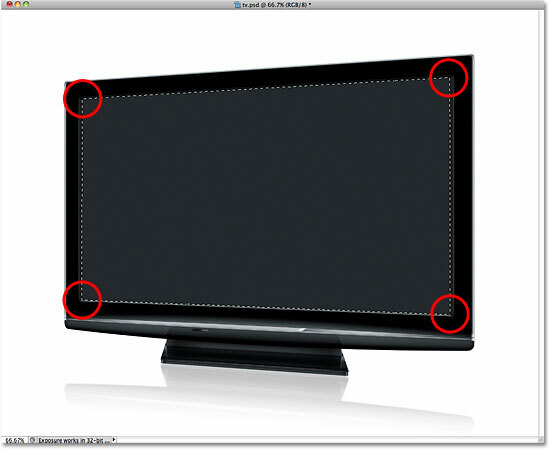 With the layer mask disabled, the second image appears in front of the tv. 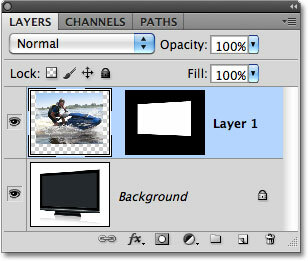 The Opacity option controls the transparency level of the layer. 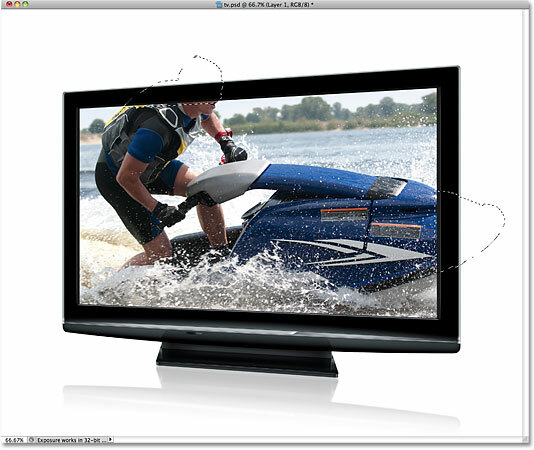 We can now easily move the photo exactly where we want it in front of the screen. Press Ctrl+T (Win) / Command+T (Mac) on your keyboard to quickly bring up Photoshop's Free Transform box and handles around the image, then move and/or resize it as needed so it appears where you want it in front of the screen. 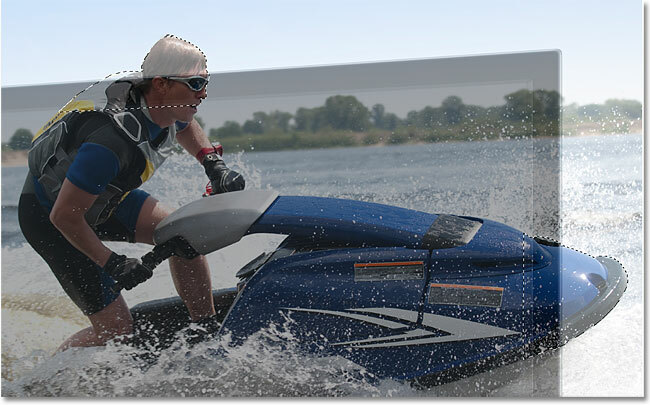 To move the image, click anywhere inside the boundaries of the Free Transform box and, with your mouse button still held down, drag the image around inside the document. Don't click on the small target symbol in the center, though, or you'll move the target symbol, not the image. To resize the image, hold down your Shift key and drag any of the corner handles (the little squares). Holding the Shift key as you drag will constrain the shape of the image so you don't stretch and distort it as you're resizing it. 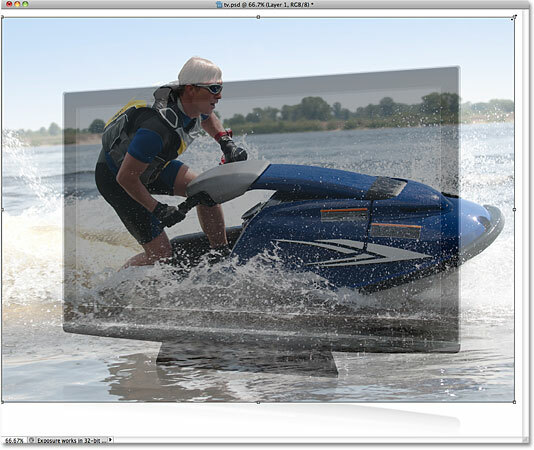 Use Free Transform to move and resize the image into position in front of the screen. 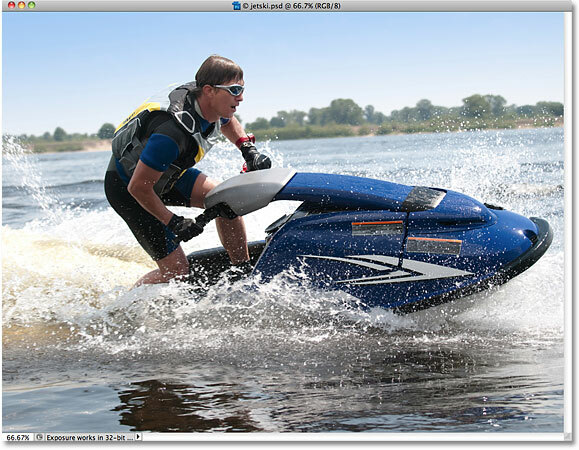 The top of the jet skier and the front of the jet ski are now selected. Turn the layer mask back on and reset the opacity to 100%. The areas we just selected will temporarily be hidden from view, but the selection outlines remain. Click on the preview thumbnail to select the layer mask. Set the "Use" option to White. Filling the selections with white has reshaped the layer mask. And there we have it! That's how to create a screen jumping effect with Photoshop! Visit our Photo Effects section for more Photoshop effects tutorials!